The best-known sight is the Cistercian monastery founded before the year 1259 by Petr Vok of Rožmberk. The complex of buildings includes the original early-gothic Monastery Church of the Assumption of the Virgin Mary. The Rosenberg family tomb is located under the floor of the presbytery. The castle complex dominates the town. 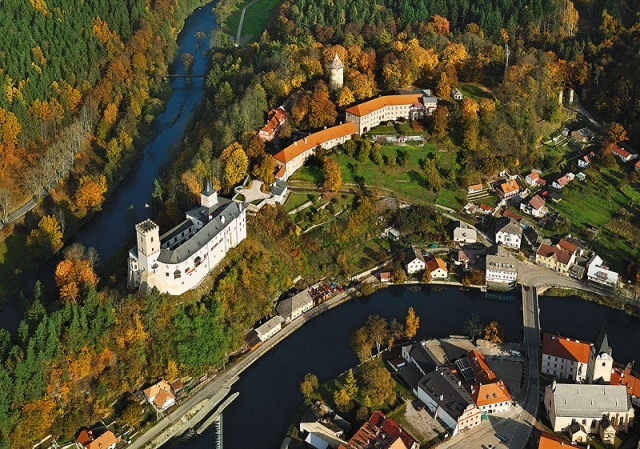 The complex was built on a promontory above a meander of the Vltava River and comprises of the so-called Upper Castle from the 13th century, of which only the round tower remains, and the so-called Lower Castle from the 1st half of the 14th century. The early-gothic (built in 1271) Church of the Virgin Mary on the square is also valuable. Urban Monuments Preservation area, registered in UNESCO’s list. The complex of buildings of the Renaissance chateau (formerly a Gothic castle) is dominated by a typical cylindrical tower. The chateau complex includes a preserved Baroque theatre from the 17th century. The historic core of the town, in addition to many Gothic and Baroque houses, also has the Gothic St. Vitus’s Cathedral, the Church of St. Jost, etc. 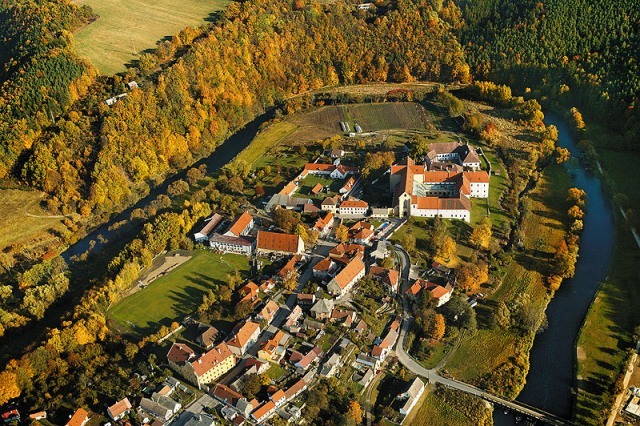 This village is primarily known thanks to its Cistercian monastery founded in 1263 by Přemysl Ottokar II. 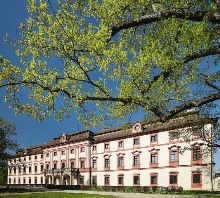 The monastery was abolished in 1785 by Josef II and was reconstructed several times over the centuries. 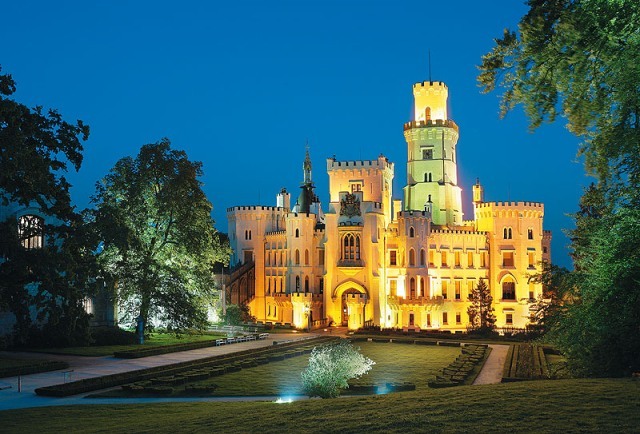 Today, it is one of the most beautiful and most valuable structures built in the South Bohemian Gothic style. The origin of this former Celtic fortified town dates back to the 2nd century BC and it reached its heyday during the 1st century BC, when it covered an area of 26 ha. Today, the location has been declared an archaeological monument reservation. The ruins of a monumental castle that was founded by the Rosenbergs in 1349, standing on a high cliff above the confluence of the Vltava River and the Křemežský stream. 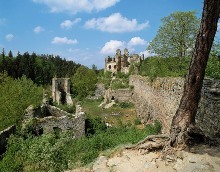 In 1506, the castle was abandoned and no longer maintained. Today, it is one of the most extensive medieval monuments in the Czech Republic. The Hluboká Chateau has an irregular pentagon-shaped ground plan and was built on the location of a former Gothic castle from the 13th century. The chateau received its current appearance, in the English Windsor Gothic style, during reconstruction in the years 1841 to 1871. 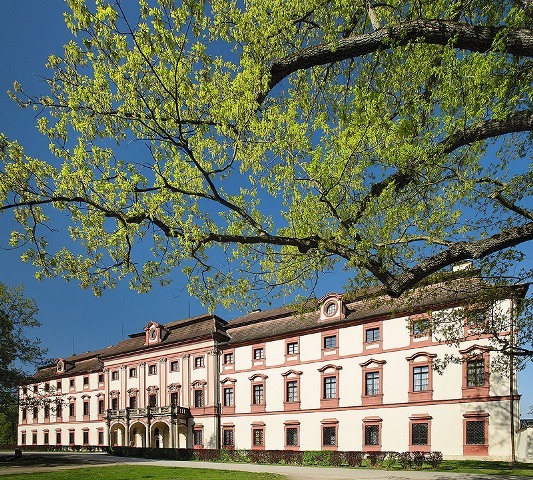 The Chateau Riding-School houses the Aleš South Bohemian Gallery. This Baroque chateau, which includes an extensive game preserve, was built during the years 1708 to 1713 according to architect P. I. Bayer’s project. In 1842, a forestry, gamekeeping and fishery museum was opened in the chateau. A small zoo is located very close to the chateau. 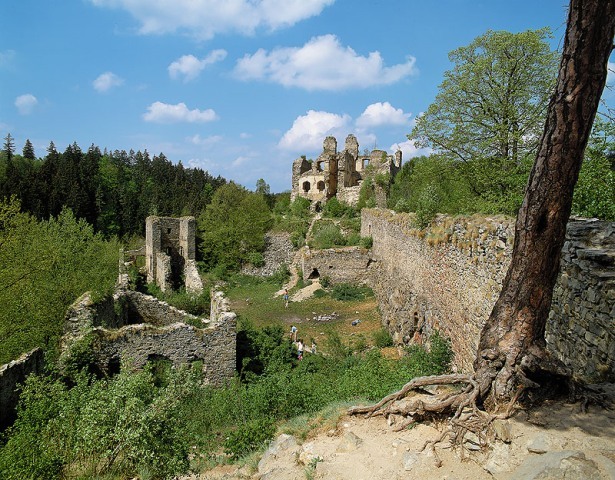 (Hrádek u Purkarce) The ruins of a Gothic castle that was built by Charles IV around 1357 on the left bank of the Vltava approximately 7 km north of Hluboká and which was probably intended mainly for hunting. The castle has been abandoned since the end of the 14th century. A picturesque chateau in Koloděje nad Lužnicí that has undergone a complicated and attentive reconstruction and has been opened to the general public since 2015. The chateau is famous for its unique murals that decorate the entire fi rst representative fl oor. The renaissance part of the chateau dates back to 1565 and was founded by Sir Adam Čabelický from Soutice. Between 1737 and 1741, František Karel Wratislav with his wife Marie Anna, maiden name Kinsky, built an extension to the residential part and an annex to the Chapel of St. Anne, which gave the chateau its current baroque looks. During high season, the location off ers costumed tours in the interior of the chateau, comedian theatre shows, traditional fencing fi ghts, stylish snack bar and picnic hampers that you can enjoy at the herb garden with views of the countryside, or in the restored chateau park with 8,500 new plants and 50 newly planted trees.